Cookie Monster: A Sweet, Sensual Id, Unfiltered The Cookie Monster is a deeply sensuous character who speaks to our most basic appetites and desires. "[We] need many things to try and make us happy," explains puppeteer Frank Oz. "He only needs one thing, and that's a cookie." NPR Exclusive: Cookie Monster Answers the Proust Questionnaire. 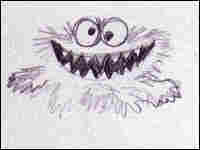 Cookie Monster, v. 1.0: The Wheel Stealer, seen here in Jim Henson's original doodle, was created for a never-aired snack-food commercial. Cheryl Henson reveals where all the cookies go. 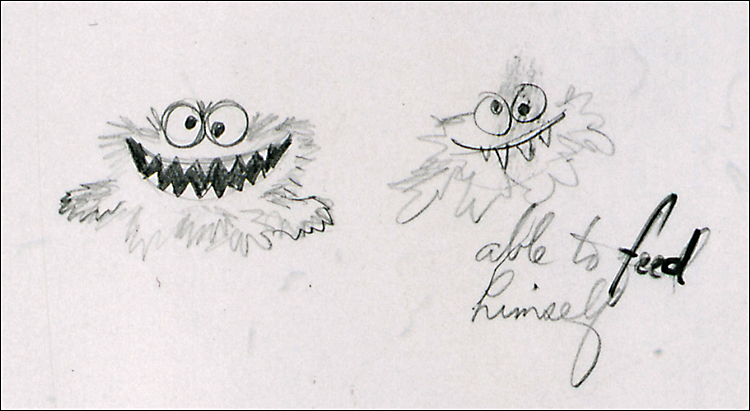 Frank Oz responds to charges that Cookie Monster hurts kids' grammar skills. 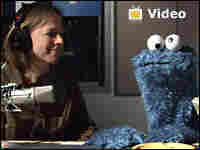 Sesame Workshop's Carol-Lynn Parente on rumors of Cookie's conversion to Veggie Monster. Parente on why "cookies are a sometimes food."